http://www.facebook.com/event.php?eid=248284341881080 Celebrate Clemson history at Legacy Day Nov. 11 The determined spirit and generosity of Thomas Green Clemson is impacting and changing the lives of all Tigers even still today. Students, faculty, staff, and alumni and friends are invited to learn about and celebrate Clemson history at Legacy Day from 2:00 to 4:00 p.m. Friday, Nov. 11, at Fort Hill. Legacy Day will feature food, fun, and entertainment including tours of the Fort Hill home. Thomas C. Myers was born in 1866 and worked in the milling and mercantile business at various points with his brothers Charles and Alfred. For twenty-six years they operated a saw mill as well as building the first flour mill near their hometown of Epsom.,Daviess County Journey,Addressed to: Miss Gertrude Dobbins, 1221 Pleasant St., Indianapolis, Indiana. Message: My Dear Gertrude: Received your card the other day. Epsom has made several improvements since you were here. No, I have never taught. This three minute video provides a travel guide to touring Venice and examples of some of the most significant structures and the history of the city. Nov. 7 - Summary of business headlines: U.S. poverty hits a record, according to Census bureau; Best Buy alters international, mobile strategy; Barnes and Noble enters tablet market with Nook; U.S. stocks rise despite European uncertainties. Conway Gittens reports. Nov. 10 - Libya emerges as an unlikely summer holiday destination at this year's World Travel Market event in London as industry professionals pull out all the stops to attract business. Hayley Platt reports. 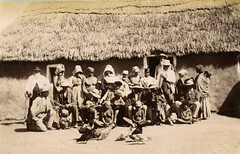 Description: "Photograph of Group of half breeds & Bushgirls, Kalahari." Author of work: Lulu Farini. Nov. 9 - Two members of "Crosby, Stills, Nash and Young" perform a free concert for the Occupy Wall Street protesters. Alicia Powell reports. Nov. 10 - Siemens, a bellwether for the euro zone's largest economy, has announced a smaller than expected dividend and given a cautious outlook after ending its year in a turbulent economic environment. Sonia Legg reports. « "Adolphe Pacault. Des livres, Une histoire", un documentaire écrit et réalisé en 2011 par Claire-Lise Gauvain (SCD Bordeaux I), Yves Gloinec, Nadège Pré, Agnès Larcher (DCAM) ( 18 min 30, VF).